Dose Ranging/ Mode of Action Establishment Trial - BlueGreen Water Technologies Ltd.
Extensive trials in Mishmar Ayalon (Israel, 31°52’20.57″N/34°56’36.36″E, June-July, 2015) were carried out in two small artificial tanks of 3.0 cubic meters each. Each tank was filled with dechlorinated water previously used for growing ornamental fish and was further fertilized with 1.0 liter of a solution containing: 16.0 g/l NaHCO3, 2.5 g/l NaNO3 ,1.0 g/l NaCl, 0.1 g/l K2SO4, 0.5 g/l K2HPO4, 0.2 g/l MgSO4·7H20, 0.01 g/l FeSO4·7H2O (Sigma, Israel). The tanks were then inoculated with Microcystis sp. at cell densities of 5-10 aggregates/ml. Ten 200 liters plastic (HDPE) barrels (40 cm in diameter) were inserted into each tank. The entire set-up (Fig. A) was thoroughly homogenized before every trial and was exposed to natural summer sunlight. Total chlorine was determined by LaMotte 1742 – Total Chlorine Pocket Tester (±0.01 ppm, LaMotte, Chestertown, MD. USA). An improved Lake Guard WhiteTM formulation was developed based on previously obtained results. While using the same active ingredient, NaDCC, this formulation features improved buoyancy and slow-release uniformity as well as reduced manufacturing costs. The formulation (88% w/w NaDCC) was selected after outperforming dozens of alternatives. After performing several experiments using intact barrels, it was decided to drill four holes (each 5 cm in diameter) in the barrel floors (Fig. B) to ease their handling in and out of the tanks. Three barrels, which were (unintentionally) left intact, were further used as untreated, bottom-sealed controls. All barrels were supplemented with ~10 kg of local earth in order to better simulate environmental conditions (Fig. B). Dose-response trial of the Lake Guard White™ at 0, 0.5 and 5.0 g/m2 (see the legend in the bottom left of panel A). The floors of seven barrels (marked numerically) were each perforated with 4 holes. Three control barrels (marked in the photo and in the legend by the letter ‘C’) were left intact. Photograph (A) of the entire setup was taken 24 hours post-treatment. Photograph (B) exemplifies a perforated barrel floor covered with local soil. Photographs (C-E) show representative 1.0 µm cellulose filters with the filtrate from 1.0 L of surface water taken 24 hours post-treatment. 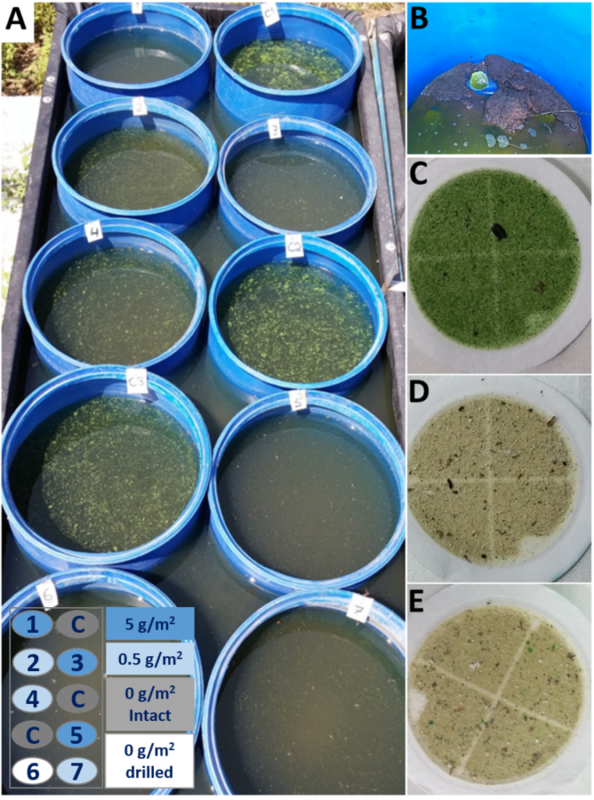 Photograph (D) The effect of the treatment on cyanobacterial cell density (perforated barrels with 0.5 g/m2 of the NaDCC-based algaecide) was dramatic in comparison to no effect observed in the (intact) control barrels (green filter, photograph C). Photograph (E) The effect on the surrounding tank water was dramatic, similar to the water in the treated barrels despite having no direct contact with the treatment itself. A dose-response trial using an improved formulation of the Lake Guard White™ at 0, 0.5 and 5.0 g/m2 (Fig. A) revealed a slight decrease in pH-levels in both 5 g/m2 and 0.5 g/m2 treated barrels – from a pH 8.9 to ~pH 8.8. Unexpectedly, the pH-level of the surrounding water (outside the barrels) also decreased to pH 8.1±0.14, although no chlorine could be detected in the water. Within 24 hours, a significant reduction in Microcystis sp. cell density was observed in all perforated barrels as well as in the surrounding water, but not in the intact barrels (Figs. A, C and D). By the end of the four day trial, the pH in the 5 g/m2 treated barrels declined to pH 7.9±0.02, the 0.5 g/m2 treated barrels declined to pH 8.1±0.1, while the pH in the surrounding water remained low at pH 7.9±0.02. The Microcystis aggregates disappeared from the water surface altogether. The pH in the intact control barrels almost did not change during the trial and measured 8.6±0.2 (at day 3) and 8.7±0.21 (at day 4). Overall cyanobacterial bloom conditions in the control barrels remained intense. The decline in cyanobacterial population levels in the surrounding water was even more dramatic than in the barrels treated with 5- and 0.5 g/m2. This observed pattern repeated itself in three separate trials suggesting that a rapid, expansive (‘diffusive’) signaling process was taking place, preceding the collapse of cyanobacterial populations. These sets of trials demonstrated the disproportional collapse of the cyanobacterial population (this time Microcystis sp.) caused by a small and insignificant chlorine treatment. More interestingly, it indicated the activation of a population-wide cell death cascade through a signal that expands rapidly and efficiently to neighboring water-columns to affect naïve cyanobacterial populations.